I just came across this term and am curious just as to what qualifies a buckle as such. We've noted that description (on the auction site that will remain unnamed) for several years, and once even asked the seller for a definition. No reply was received. Our guess is that it means a one- or two-piece silver (colored) belt clasp. But we would like to hear other thoughts, too. 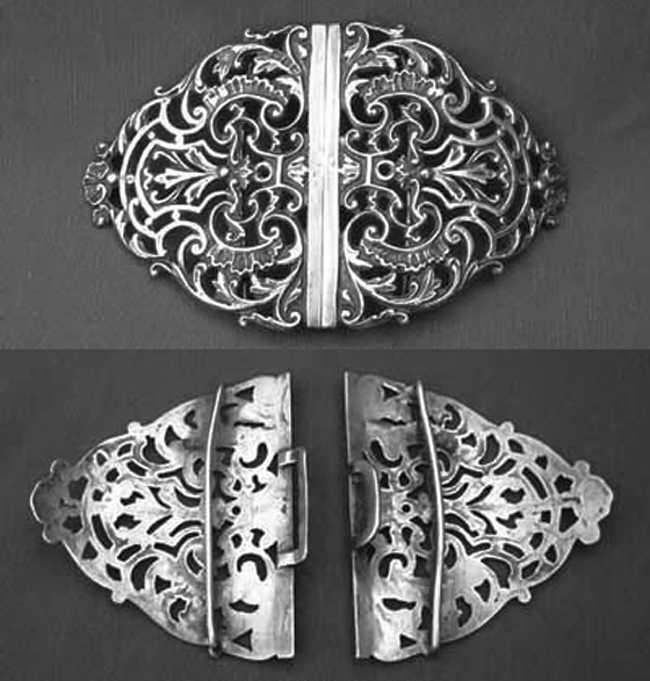 Not a true buckle, but a clasp with two symmetrical sides. Traditionally used for securing a nurse's cape. They can be found in brass, silverplate, and sterling, plain to elaborate, and often carry the symbol or name of a particular nursing school or hospital. Have had a few over the years, similar to the one wev shows - the references that I found were in fairly recent books on jewelry and accessories, and if I recall correctly, they were used for the nurses' belts and a traditional gift on their graduation (believe they're still produced in the U.K.). This object is a handcrafted Sterling silver belt buckle. The buckle has been made in two separate pieces that would have originally been attached to the ends of a belt. The two sections of the buckle can be fastened together using the clasp. 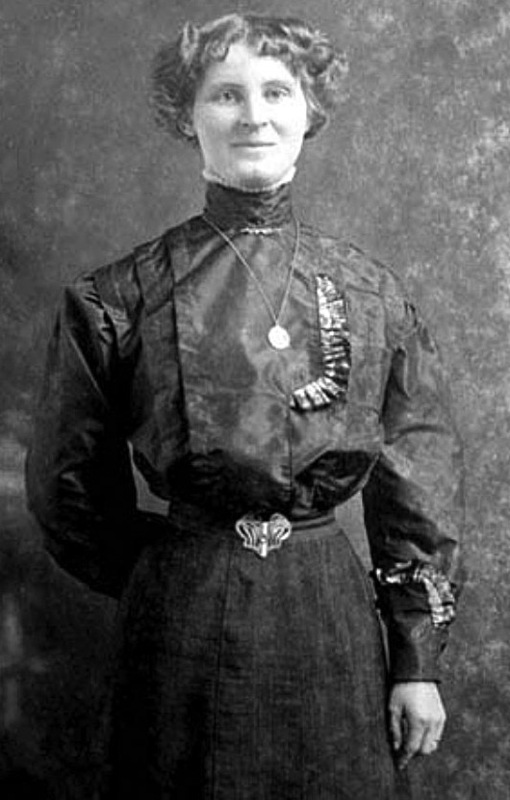 This type of two-piece belt buckle is often called a nurse's buckle as they were included as part of their uniform. Similar buckles are used by nurses today. 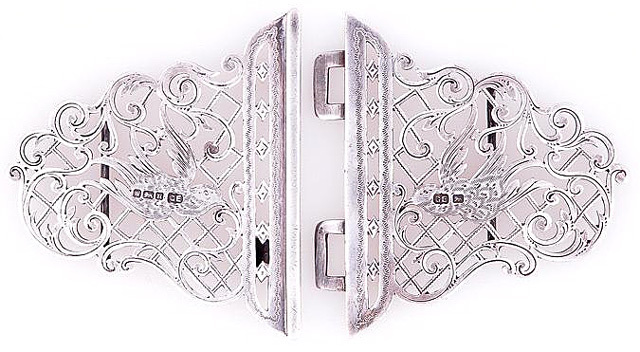 Both parts of the buckle are decorated with a bird in flight against a background of fretwork and scrolls. The decoration has been achieved using a handcraft technique called saw piercing. This is a labour intensive, highly skilled traditional method of working. A similar effect can be achieved using a mass production technique called punch piercing. This relies on the use of punches and a fly press. The technique is cheaper and less labour intensive than hand piercing, but the effect is usually simpler and more standardised. The buckle was made by George Ellis (1863-1944), who worked as an independent silversmith in Sheffield. In 1895 Ellis began working from a workshop in Court 2, 16 John Street, near London Road. This address was occupied by a number of craftsmen at the time including a "scissors smith" named Charles Reynolds, a file forger named William Addy, a silver plater named Joseph Turner and William Stones, a silversmith. In 1900, George Ellis moved his business to 100a Charles Street. He is described in the Sheffield trade directory as a "maker of fish eaters, carvers, desserts, jams, butters, spoons &c. to the trade". Records at Sheffield Assay Office indicate that Ellis registered his first mark, 'GE', in May 1912. At this time George, Louisa and their daughter Winifred Grace were living at 199 Chippinghouse Road, just off Abbeydale Road. In 1932 the business became a limited liability company and was renamed George Ellis (Silversmiths) Limited, based at 107-109 Arundel Street. A trade directory of 1934 describes George Ellis as the Managing Director of the business. George Ellis died in 1944 and little is known about the fortunes of the company after this time. It continued to trade on Arundel Street, but is not listed in the trade directories after 1971. The premises of George Ellis (Silversmiths) Limited can be seen on Arundel Street today. The original signage is still present on the building. As part of the DCF funded Living Metal project, we visited Ken Hawley and Joan Unwin at the Hawley Collection Trust to find out more about how the buckle was made. The Hawley Collection is an internationally important collection of edge-tools and cutlery, primarily made in Sheffield. Hidden History: how was it made? "This is known as pierced workÖfretwork in metal" (Ken Hawley). The outline of the buckle is first marked out as two parts on sheet silver. The two edges are soldered to lock the two halves together. The buckle then goes to the saw piercer. Joan informed us that template designs (called scales) for saw piercing were made from brass sheet. Inked paper rubbings are made from the original and transferred to the object to be worked on so that the pattern can be repeated easily. Ken described how a 'tache' (a forward extension to the front of the bench, as can be seen in the above image) is bolted into place and used to support the work as it is pierced. A drilled or punched hole is made into each section of silver in the design that needs to be sawn out. The fine saw blade is threaded through the hole and fixed into the piercing frame. The saw is usually held in position and the object is moved around until the piece of silver is sawn out. The blade is then unscrewed and moved into the next hole until the design is complete. Engraving or chasing then completed the decorative effect. When all the silversmithing has been completed the buckle would be sent to the Assay Office for hallmarking. A worker named a buffer then polished the now completed buckle before it went to the warehouse where it would be wiped then wrapped in acid free tissue paper, ready to be sent to the customer. This object is part of the George Ellis Collection. These kinds of clips have been around for a long time - both to secure sweaters, capes, cloaks and such, as well as belts (mainly belts that are more decorative than ones that must be strong enough to functionally hold your slacks up. The more common name is sweater clips, which come like the ones shown sometimes, and other times they have an additional chain between the clips to give a greater spacing. Unless they have a nursing emblem on them, giving them a romantic name such as 'nurses buckles' might be a bit of a stretch. The more likely reason to call them all by this name is to increase their marketability in the antiques trade where giving a name to a style of antique object or a group of similar objects engenders an interest to collect those objects. The antiques trade is full of such names. And when no one comes up with one they do things like add '--alia' to the end of a common descriptive name such as 'kitchen-alia' for old kitchen utensils. I may be looking at this from a bit of a different angle - started collecting buttons, and other sewing accessories in my teens (edging up on 40 years now), and buckles, clasps, sweater clips, bib holders, lingerie pins, studs, and various other bits of clothing paraphernalia (often just a single piece of a pair or set) commonly end up tossed into button boxes. Have had a number of cloak/cape clasps of similar design to the "nurses' buckles", with hook & eye closures and sometimes chains, but rather than a bar as on the buckles, they'll have either multiple shanks or sew-thru holes to attach them to the garment. Can't say that I necessarily believe these were originally designed for use by nurses, but they were definitely favored, as they can be found in pictures of nurses dating back as far as the late 1800s and throughout most of the 20th century (as said, still readily available in U.K.). Can also say, having had a number of modern belts in both leather and elastic with similarly constructed buckles - they are quite sturdy and functional. thanks all, that has clarified this for me. Thank you all for these enlightening answers to our question. It is fun to see an old photo showing a belt buckle but what leaves me wondering is the size of her waist?